Semi modular synths are becoming increasingly popular, so much so that it almost feels like if your synth doesn’t have a patch bay, you might be missing out on something, like interesting sequencers such as Rene 2 or Ornament and Crime, or sound generators like Rings or Plaits, and many many more, that you just can’t find in regular synths. Or maybe you want to enhance your modular setup with components of regular synths, like the expressive grid controller of Medusa or the easy to use FM engine of Digitone. Bridging modular and “regular” synths can be seamless, but it does require an understanding of audio levels, how notes and modulation information is sent over CV and MIDI, and how MIDI and control voltage timing works. Unfortunately, there is no one product that is the perfect MIDI to CV and CV to MIDI patch-bay add on, so in the companion video I break down the various components of MIDI and CV, and discuss various modules that can together behave as the “ultimate patch-bay” for regular synths. In order to make this work, we need to understand how Eurorack modules exchange different types of musical information, as opposed to how “regular” synths do it via MIDI. Generally speaking, Eurorack modules speak analog control voltage using a TS, or Tip Sleeve type of cable. Audio, notes data, triggers, clock and modulation – all pass through these cables and it’s how modules speak with each other. The information a eurorack module or semi-modular synth sends or receives is typically labelled clearly near the output or input. Voltages typically range from -10v to +10v, and how this voltage changes or is treated on the receiving end determines the type of message it sends. Regular synths communicate differently. Audio output is typically analog as well, but at different levels – much lower than eurorack. Notes and clock information are sent and received digitally via MIDI. Many regular synths are capable of receiving and sometimes sending modulation information over MIDI, but typically how they do it isn’t clearly labeled on the device itself, but rather left to an appendix at the end of user manuals, and just like your own appendix, seems like a pain you want to avoid. If you want to change the timbre on a Digital synth using a different synth, you need to open up the manual, and find the CC message that’s relevant for the particular parameter you want to change. Like I said, a bit of a pain, but worth the effort to understand it. Anyway, let’s look at bridging these two worlds one by one. Audio is the easy part: Eurorack audio levels are high, or hot, meaning they oscillate from -5v to +5, or 8v or even 10 volts. Regular equipment will at best distort and at worse be damaged at those levels. If you want to send audio FROM eurorack to regular audio gear, you need to attenuate it, and if you want to go the other way around, you need to amplify it. For attenuation, in the example in the companion video I use a mixer to attenuate audio, as long as it has level control, or a module like SBG from ALM, which is designed to interface from and to eurorack gear. Bringing audio back up from regular gear to eurorack levels requires an amplifier. A regular VCA might not do the trick. Here too SBG has an amp for this purpose and can amplify much more than a regular VCA. Unlike analog audio, which is sort of similar in eurorack and regular synths, note information is very different when you compare MIDI to Eurorack. MIDI is digital, whereas CV note information is analog. With MIDI, notes are sent in two separate MIDI messages – one activates the note at a certain pitch and velocity, and second is sent later on, when it’s time to turn the note off. You can send as many notes as you want through a single midi cable, and they can be sent in any one of 16 different channels, again, on a single cable. Eurorack or CV notes are very different. A single cable can only contain the pitch of one note at a time. The typical standard is 1 volt per octave, and one cable can’t also contain velocity, on-off or any other information (except pitch bend…). Note on and off information needs to be sent in another cable, and that is sent either as a high voltage level that needs to be held for the duration of the note – which is called a gate, or, if you’re triggering a note or percussion then a short voltage peak trigger will do as well. Finally, if you want to send velocity or modulation information, you’ll need another patch cable for each. MIDI can hold all that information in one single cable, for all the notes going through it. So… you can see why if you’re into creating polyphonic music on eurorack, you need to get ready to buy a lot of cables, or try and stick to MIDI. Regarding ongoing modulation or expression information, since MIDI notes are one-time on or off events, MIDI modulation is sent using a different type of message, called a control change, or CC. In addition, there are a few dedicated non CC-midi commands like pitch bend, after touch or pressure, and program changes. Before getting started sending or receiving MIDI information, you need to make sure your synth has those functions turned on. We’ll talk about Notes, CC and Clock and Transport individually but if your synth has those communication options blocked we’re not going to get very far. Find the configuration menu in your synth and turn on MIDI Tx or Rx, or transmit and receive. Sending MIDI information into Eurorack requires a module that will take MIDI messages and split their various parts into individual cable outputs. There are a few ways MIDI messages can be sent into a module: traditional MIDI DIN, and that can be either built in the module like in POLY from PolyEnd, Aither from Istruo or Hermod from Squarp, or with an expansion module, like in General CV or Disting from Expert Sleepers. Some modules support USB and 1/8 inch TRS MIDI, and Aither can also send modulation information wirelessly. Once the MIDI connection is made, a MIDI to CV module will let you split it up and assign it to various outputs. Let’s look at a few examples. The POLY module is very simple and straightforward – each note is assigned pitch, gate, velocity and modulation outputs, and it can handle up to eight notes simultaneously, which is great if you want to use it with a controller that supports polyphonic expression. Other modules shown in the companion video have fewer outputs but other non MIDI related functions. Disting for example will only let you send one note at a time, but it’s a multipurpose module with over 80 other functions. Hermod lets you configure how you want its outputs assigned: you can have eight note and gate pairs, and you can configure Hermod to output velocity and modulation like Poly, but you’ll start using up more outputs and won’t be able to send out as many notes. So Hermod doesn’t have as many outputs as POLY, but does have a fantastic built-in multi track sequencer with MIDI or note effects. So, you can see why just recommending one module and being done with isn’t easy – it depends on what you need for your setup. A good MIDI to CV module will also covert MIDI Pitch bend information as modulation to the note information sent out the Pitch output. There are a few other manufacturers that make MIDI to CV modules not shown here – Yarns from Mutable, FH2 from ExpertSleepers, Mutant Brain from Hexinverter and more. Aside from note information, you might want to send modulation information from the synth world over to eurorack. A good use case for that is the mod wheel on MIDI keyboards, or in the case of Medusa as shown in the companion video, every single pad sends out modulation information as you roll you finger up and down the pad, and can also send pressure information in MIDI as you apply pressure to the pad. Aside from ModWheel, Aftertouch and Pitch bend, some MIDI to CV modules will let you assign any CC channel to voltage as well. There are at least two cases where that would be useful. The first, is that most digitally controlled synths, even if their core engine is analog like this one, also send CC information as you turn their knobs. This information can be send to a module like Aither, which can then in turn convert that CC information, or knob movement, to CV that can be applied to any CV input. Furthermore, some instruments like the Digitone and Digitakt have a built in MIDI LFO, which means is can generate CC modulation in various interesting LFO shapes, that can also be synced to its tempo. This can then be converted to CV and applied to eurorack modules. 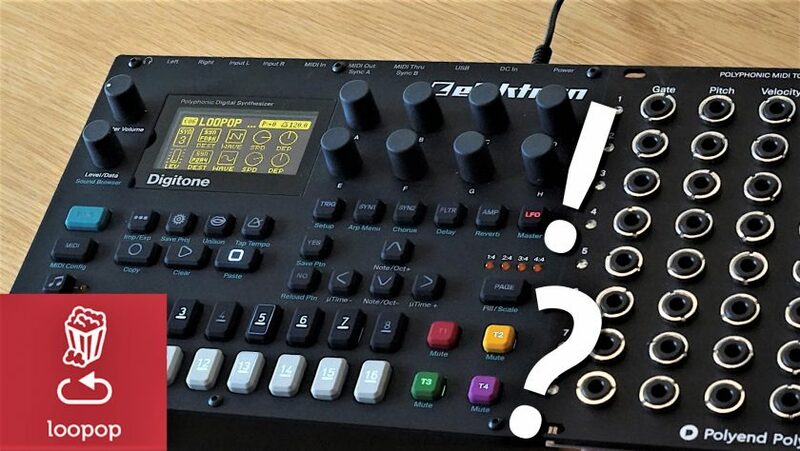 Even if you already have an LFO, the Digitone and Digitakt LFOs have a few other tricks up their digital sleeve that you might not find in eurorack LFOs. OK, so we talked about bridging MIDI to CV so that you can get your MIDI controllers to talk to eurorack – what about going from CV to MIDI, so that we can apply some of the interesting sequencing and modulation options of eurorack modules to our plain old hardware synths? Here too there are a few ways to go about it. The first is by using CV to MIDI modules. Disting MK4 with an expander module and Aither are examples of such modules, and probably the most comprehensive one is General CV from Expert Sleepers. Disting can convert CV Gate and Pitch into a MIDI note and either send velocity or convert CV to CC using one more output. Aither can convert four different voltages to four different configurable CC channel values, and I believe they’re going to add the ability to convert a pair of inputs into one MIDI note, and the king of the CV to MIDI hill is General CV, which as nine CV inputs that you can configure as either 9 separate CC channel outputs, or up to 4 CV/Gate pairs to send notes via MIDI, or any combination thereof. Each of these modules aren’t just one trick CV to MIDI modules – other things they do are beyond the scope of this video, but in general, as mentioned above, Disting is a multi-purpose module with about 80 other functions, Aither will also let you send and receive modulation information wirelessly, and General CV also has a built in polyphonic digital synth and drum machine. If your synth has an expression pedal input, another trick to converting CV to CC messages without using modules such as these, is to use a floating ring cable connected to an attenuator that can limit and ensure positive voltage output matched to the voltage your expression input is expecting. I’ve already shown how to do this with Maths or SBG by ALM- in this video. The last piece in the puzzle for bridging between the eurorack and synth worlds is clock. If you want to have more than one sequencer running at the same time across modular and regular synths, you’re probably going to want to keep their clocks in sync. Clock really means two things, though some synths bundle them together – transport – which controls starting or stopping your sequencer, and tempo. For transport, MIDI has simple start, stop and continue transport messages. In the modular world, it depends on your module – some modules don’t have any transport functions, others may either accept start, stop or reset trigger messages, and others may run the transport based on gate or high voltage messages. For tempo sync, MIDI works on a 24 PPQN basis, or 24 Pulses Per Quarter Note. So, for example, if a sequencer on the receiving end wants to move one quarter note forward, it will count 24 MIDI pulses, and then play the next note. In Modular, some modules will just move a step forward every time they receive a trigger, and others will accept different PPQN timings, so you can have them run as a multiple or division of the original tempo. Don’t forget what I mentioned in the beginning of this video – your synth needs to be set to receive and send transport and clock. I’ve seen many synths have that off by default. To move transport and clock from MIDI to modular, you can use a module like Hermod or Disting with its expander module. So, that’s pretty much it! There’s no need for your “regular” synth to be left out of the eurorack party. Audio, notes, modulation and clock can all be seamless synced across MIDI and CV so that you can enjoy the best of what both worlds have to offer.